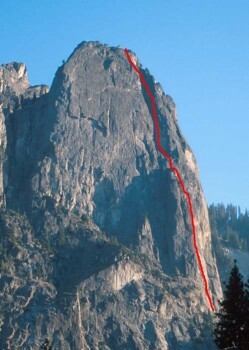 The Steck-Salathe is a route with a reputation as a "hard 5.9." It consists of sustained physical climbing, off-widths, chimneys and awkward climbing. This climb requires most parties a long day to complete. The protection is good for all crux section and the quality of the route is stellar. The temperatures are comfortable even in summer because the route ascends chimneys that provide shade in the afternoon. Spectacular views from the route and especially from the top of The Sentinel provide a glorious reward for completion of a worthy route. Which SuperTopo guidebooks include a topo for Steck Salathe? Even in the infancy of Valley climbing, Sentinel Rock beckoned. Its northern escarpment, especially at sunset, glistened with cracks and dihedrals, some perhaps climbable. Pioneers of the 1930s ventured up the lower, tree-covered part of the formation, returning humbled by the nightmare above: a 1,500-foot wall of tremendous steepness and disconnected crack systems. Yet after the Lost Arrow Chimney climb of 1947, the upper north wall of Sentinel became the "next great problem," and the route was never in question: head for the top of a prominent buttress (soon named the Flying Buttress) and enter the Great Chimney, which led to the top. In 1948 Robin Hansen, Fritz Lippmann, and Jack Arnold made the first attempt—and quit after 100 feet. Jim Wilson and Phil Bettler were next, a year later: they got one pitch higher. Wilson and Bettler soon returned with two of the most competent climbers of the day, Allen Steck and Bill Long, but this team turned back after two days and 450 feet. Long and Bettler came back in May 1950, reaching the halfway point, the top of the Flying Buttress. They retreated. Four attempts, four retreats. Steck had watched the last bid with great interest, and was not unhappy with the outcome. “I lay awake many a night in Berkeley,” he later wrote, “wondering what this north wall was like above the buttress; it was almost an obsession with me.” Steck was no stranger to difficult climbing. In 1949 he had become the first American to climb one of the fabled “Six Great North Faces” of the Alps when he did the Cima Grande in the Dolomites. Sign In or Join SuperTopo (it's FREE!) to read the complete route history, the recommended strategy for climbing this route, and useful tips should you need to retreat. Sign In or Join SuperTopo (it's FREE!) to read this route's approach information. Sign In or Join SuperTopo (it's FREE!) to read this route's descent information. The long and demanding Steck-Salathe. Time to generate this page: 0.10 secs.